Do you believe in the goodness of God, even in the face of disappointment, pain, and personal tragedy? I’ve discovered faith in Christ makes the most sense when life makes the least sense! After all, no one would need reassurance that God works all things together for good, if everything was already good! No, we need the reminder that God is working for our good precisely because things aren’t always good- yet! In order to receive the specific promise that God is working for our good, we need to focus on God’s character as revealed throughout Scripture. For instance, a believer must accept two biblical truths about God in order to grasp the truth of Romans 8:28.
a) God is good. It’s who He is. He isn’t against His people (see Romans 8:31). He isn’t looking for ways to hurt you (see Jeremiah 29:11). My first pastorate was a country church in the tobacco fields of rural Kentucky. One of the most faithful men there was a recent convert and after fiery sermons he reminded me how much he “enjoyed” the messages because I “stepped on his toes.” He was a good man and I appreciated his friendship. He exemplifies, however, many believers I’ve known. He “felt” a greater connection to God when he felt most guilty! I understand conviction is absolutely necessary but we can move beyond condemnation (see Romans 8:1) to forgiveness (see 1 John 1:9), and abundant life (see John 10:10)! Why? Because God is good. God wants what’s best for His children just as a loving dad or mom wants to bless their children. We desire good things for our kids and God is a far better parent than we are and He desires to do you good! Since He desires our ultimate good, we can approach Him without fear of condemnation. b) As a follower of Christ you must also believe that God is all-powerful. As a result, if He promises to work all things together for good- He has the power to deliver! He is good and He does good and believers benefit from His goodness. HOW DOES GOD’S GOODNESS WORK IN A WORLD OF TROUBLE? We are surrounded by evil. People can be cruel to a degree that leaves most of us stunned. The sexual slavery of children, the global jihad, school shootings, the ruthlessness of the drug cartels, and the murderous rampages occurring in some American cities are only a few disturbing examples of our broken world (which continues to be a dangerous, painful place). In the face of these horrible realities it’s not unusual to hear someone ask, “How could a good God allow all of this?” Even people of faith are often staggered by the harshness and injustice of life. Yet we are called to believe. As believers we are not immune to the brutal realities of pain and problems. We know these things did not originate with our good God. We know we have a demonic enemy who wants to destroy everything good. We know Jesus predicted the world will get more dangerous, rebellious, and faithless as we near the end of time (see Matthew 24:7-14). In fact, it is precisely what “we know” that makes the difference for us. What I mean is this- notice the first two words of Romans 8:28- “We know.” God has given to His church a knowledge no one else in the world has. We know God is working through the horrors of life to bring good into our lives. We anchor our faith to the certainty of God’s goodness even during the blistering storms of trouble! God also challenges us to reject any worldview that might argue God lacks the power or willingness to involve Himself in our story. Romans 8:28 states God is working in all things- not some things, or a few things, or even most things- God is working in all things for your good. Therefore, in spite of sometimes unthinkable suffering, you will not be forgotten or abandoned. Through even your most painful moments, God is still at work to bring about something good. He is working in you right now! God is good and God does good. Finally, God is bringing everything in your life- the good and the bad- to His workshop. He is causing all things to “work together”(v.28). In other words, God doesn’t overlook any of your life. The Greek word translated “works together” is “sunergeo” from which we get our English word “synergy.” Synergy is the force of multiple factors, within a system, combining to create an effect greater than the sum of the parts. Someday life will all make sense because God is bringing the apparently unrelated parts of your life- the good, the bad, the confusing, and even the unknown, together so it all “works together” for your good. 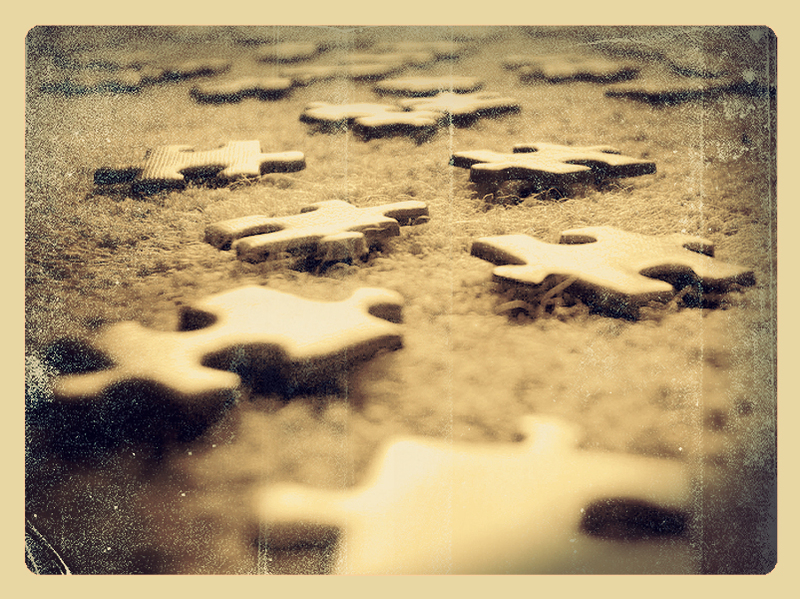 Sometimes life looks like a puzzle with too many pieces that don’t seem to fit. We can feel frustrated by unfulfilled desires- like pieces of the puzzle which should easily interlock but rarely if ever do. At other times, we can act in self destructive ways and become our own worst enemy, trying to force pieces of the puzzle of our lives into places they were not designed to fit and this unwise action can cause damage to the pieces or the puzzle itself. Still at other times, some fool just flips the table over- spilling our unfinished puzzle onto the floor into a jumbled mess of pieces. After being victimized by evil, or suffering through some intense tragedy, we can feel so demoralized we are tempted to give up. It’s unfortunately true, life can feel like that, but our faith speaks softly to our bruised hearts reminding us it is God- not us- who is ultimately responsible for bringing all the pieces of our lives together. And when He does, He is working for our good. As a follower of Jesus Christ, you will not be able to avoid hardship, ridicule, persecution, and the ordinary daily difficulties of life. Life for the Christian can be full of love. It can be abundant, exciting, and deeply fulfilling- but life can be hard. It can seem completely unfair at times. There may be days when you won’t understand why things are the way they are. Yet as Christians we are assured God knows exactly what He is doing- and what He is doing is always good. Always.